When reviewing a client's Electronical Medical Record (EMR) in NutriAdmin, you will find information organized in several tabs. The client record screen is designed to contain all data over time for a given client. Rather than having to browse through different files, systems, and programs, you have everything about a client in one place. This is a short summary of your client. It includes basic information such as name, email, gender, date of birth, medication, and medical conditions. The overview screen is intended for you to have a look and understand in 30s who is this patient, and what are the most important things to be aware of. This is specially useful if you have many clients, and you have long relationships (over months, or even years) with them. If you only had a minute to review who a client is and what are his/her needs before a consultation, you'd go to the overview tab. E.g. patient A may be a 27 year old woman that is pregnant, needs special nutrition advice, is allergic to peanuts, and is taking medication X. Patient B may be a 54 year old man with diabetes, a history of obesity in his family, and whose worst habit is eating in fast food restaurants on a regular basis. Patient C may be an athlete that wants to perform at his best. The above individuals are very different, and require completely different advice in a consultation. The overview tab let's you write down the most basic description of an individual so that you can know a bit of who they are and what they need with a quick look – removing the need to dig down in consultation notes or questionnaires after the first consultation. 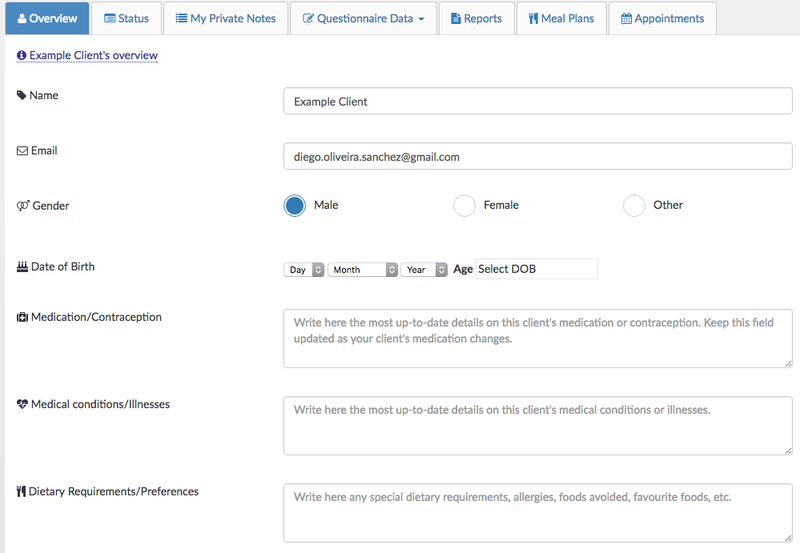 This tab shows you the status of different actions taken in NutriAdmin regarding your patient. The goal is to allow you to answer quickly questions such as: has this client returned his questionnaire yet?, did I remember to write a report for her?, When was the last time I sent a questionnaire?, Did I sent her appointment slots?, etc – without having to check many files, emails, documents, etc. Questionnaires Returned: This tells you the number of questionnaires that have been completed by this client. The number will be 0 if no questionnaires have been returned yet. Edited Private Notes Fields: This row informs about how many fields (questions) have been edited by you in the Private Notes tab. It will be 0 if you haven't written anything yet for this client. If the number is low (e.g. 1–5) this may mean you started writing consultation notes, but didn't finish yet (you only wrote about 1–5 questions). Edited Questionnaire Data Fields: Number of questions answered in questionnaires. If the number is 0, your client didn't complete the questionnaire yet (or submitted it empty by mistake). If the number is low, e.g. 3, then this means your client only completed 3 questions, so you may have to re-send the questionnaire. Reports: Number of NutriAdmin reports you have created for this client. It will be 0 if you haven't done any of them yet. Meal Plans: Number of meal plans created for this client. Appointments Pending My Confirmation: This will tell you how many appointment suggestions a client has proposed after you send him/her an appointment slots email. Most of the time this will be 0. Scheduled Appointments: Number of appointments in your calendar that reference this client. If the number is zero, it's presumed that you haven't register any appointment yet with this person in NutriAdmin. Apart from the different numbers in the status table, you can also quickly see at a glance how many of the actions are completed (in green) or may need attention (in yellow). Having many pending actions with a client (yellow) gives you an idea that this must be a new client who you are still having consultations with, need to schedule appointments, and write reports, etc. A client with fewer pending actions is likely someone you've already worked with. Finally, the status tab also shows you if you've sent questionnaires to your client yet or not. You can also reset a questionnaire here... more information about resetting questionnaires can be found by clicking here.. This tab gives you access to all the reports you've written for this client, sorted by date. This tab shows you the different meal plans you have created for this client over time, sorted by date. Here you can review past and future appointments with this client, as well as confirm any appointment suggestions made by a client after you've sent them appointment slots.